The 1971 United Nations Day Concert was held in the General Assembly Hall at United Nations Headquarters this afternoon. "Hymn to the United Nations", a new composition by Spanish cellist and composer Pablo Casals, with a text by American poet W.H. Auden, was commissioned by UN Secretary General U. Thant to mark the twenty-sixth anniversary of the United Nations and performed by the Orchestra of the Festival Casals, with the UN Singers and the Chorus of the Manhattan School of Music, under the direction of Maestro Pablo Casals. 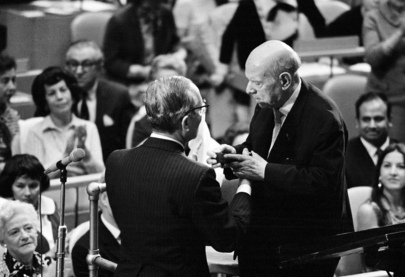 Maestro Pablo Casals (right) is seen here as he received the United Nations Peace Medal which UN Secretary-General U Thant, awarded to him and to W.H. Auden, who was not able to attend the concert.